For your convenience, below you'll find answers to some common questions we get about Illuminatural 6i® Advanced Skin Lightener. Please take a moment to review them and if your question isn't answered here, please be sure to contact us directly. Illuminatural 6i® Advanced Skin Lightener is a topical serum that uses the latest developments in skin whitening science to noticeably lighten and brighten your skin through daily application. Dark spots fade and skin tone is evened as this unique formulation of 6 clinically proven active ingredients, 8 natural plant extracts, and 5 refined minerals work together to fade excess pigmentation by helping to block and stop production of melanin pigment – sloughing off dead, pigmented cells while migrating new, lightened skin cells to the surface! Problem areas are noticeably lightened with daily application, with best results after 90 days use. What makes Illuminatural 6i® different from other skin lightening creams? First, it doesn't just “scrape off' or “exfoliate” the surface of your skin! 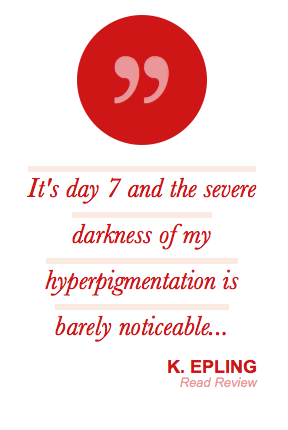 … Which is the pigmentation causing your dark spots and blotchy complexion! Second, it helps to promote a healthy cycle of skin cell regeneration, getting rid of your dead pigmented skin cells while helping your fresh, lightened skin cells migrate to the surface. And third, it accomplishes all of this without using ANY toxic ingredients! There is no synthetic hydroquinone, mercury, steroids, or bleach! What types of skin pigmentation will it get rid of? Illuminatural 6i® helps lighten all dark spots and uneven skin tone caused by excess production of melanin in localized spots. So it works to help lighten freckles, birthmarks, dark inner elbows, knees, age spots, sun spots, liver spots, acne scars, old scars, melasma, choasma, hyperpigmentation, post-inflammatory hyperpigmentation, senile lentigines, and more! If it's caused by excess deposits of melanin, Illuminatural 6i® should help! Will it work for all skin tones? Yes! Illuminatural 6i® works equally well for all skin tones including Asian, African American, and Caucasian. Does it contain hydroquinone or other toxic substances? No, Illuminatural 6i® includes no synthetic hydroquinone, mercury, steroids, or bleach! Can I use it on my acne? While Illuminatural 6i® is not specifically recommended for the treatment of acne, it's excellent for helping to reduce the appearance of your acne scars. And it's worth noting that some of our clients have reported seeing an improvement in their acne outbreaks while using the serum. This is likely because Illuminatural 6i® contains a series of ingredients that help to normalize your skin's natural regeneration cycle. Can Illuminatural 6i® be used on more sensitive or intimate areas of skin? Before liberally applying the serum to your more sensitive skin, we recommended testing a small amount to make sure you don't have an adverse reaction. No adverse reactions have been reported, but everyone is different. I have sensitive skin… will this cause rashes, breakouts, etc.? If you're concerned, you should always test the product on a small, inconspicuous area of skin like your upper arm or jaw line to make sure you don't have a reaction. Again, no adverse reactions have been reported, but everyone is different. If you're concerned, remember that Illuminatural 6i® comes with a generous money back guarantee. So there's no risk in testing it. What are the directions for usage? Apply in small dots to areas of skin that you wish to lighten, smoothing gently until the serum is fully absorbed. For best results, apply twice daily, morning and evening, until results are achieved. Suitable for use on both the face and body. Can be worn under makeup. Because your skin's natural regeneration happens as a 28-day cycle! ... While waiting for your lightened skin cells to take the place of the darker, pigmented cells. And this takes at least 28 days – but more realistically, to achieve significant lightening, you should plan to commit to using Illuminatural 6i® daily for a minimum of THREE CYCLES of skin cell regeneration, which is about 90 days! There are no known side effects. Though it is not recommended that you use Illuminatural 6i® while you're pregnant or breastfeeding. Can I see a complete ingredient list? INGREDIENTS: Water (Aqua), Aloe Barbadensis Leaf Juice, Sodium Lactate, Magnesium Ascorbyl Phosphate, Niacinamide, Dimethicone, Pentylene Glycol, Palmaria Palmata Extract, Titanium Dioxide (CI 77891), Silica, Mica, Alumina, Stearyl Alcohol, Glyceryl Stearate, PEG-100 Stearate, Glycerin, Beta-Glucan, Alpha Arbutin, Camellia Sinensis (Green Tea) Leaf Extract, Vitis Vinifera (Grape) Seed Extract, Vaccinium Myrtillus (Bilberry) Extract, Silybum Marianum (Milk Thistle) Extract, Pinus Pinaster Bark (Maritime Pine) Extract, Ginkgo Biloba Extract, Tocopheryl Acetate, Magnesium Aluminum Silicate, Hydroxyethyl Acrylate/Sodium Acryloyldimethyl Taurate Copolymer, Tetrasodium Glutamate Diacetate, Fragrance (Parfum), Xanthan Gum, Ethylhexylglycerin, Phenoxyethanol. Can it be used during pregnancy of breastfeeding? No, we don't recommend use during pregnancy or breastfeeding. Where is Illuminatural 6i® manufactured? Illuminatural 6i® is manufactured in the United States according to strict cGMP standards in an environment with comprehensive quality controls that comply with international standards and has been tested in an FDA & Government approved Public Laboratory. We offer outstanding shipping options that meet the needs of every one of our customers. We can get Illuminatural 6i® to you as fast as you want. Please try our product for 90 days (3 containers) and if for any reason you are not 100% satisfied, simply return the three empty containers within 97 days from the time of delivery for a full refund excluding shipping charges. If you wish to take advantage of the price discount by ordering multiple containers don't worry. Any unopened containers returned along with your first three opened containers within the 97 day guarantee period will also be eligible for a full refund. How can we make this incredible guarantee? Because we KNOW you will be satisfied with our product. Please do not ship any product back after the 97-day refund period has expired. Returns must be received back at warehouse within 97 days of delivery with no exceptions. Please feel free to try our products, but refunds are limited to one order per customer. Yes... Customer feedback indicates that women see the best skin lightening effects with a minimum of 90 days use (the equivalent of 3 cycles of skin cell regeneration). So to encourage your commitment to 90+ days of use, we offer generous savings to those who invest in a 3-month supply or more.